Yann Guichard and his elongated ORMA 60 trimaran Gitana 11 left their homeport of La Trinité-sur-Mer last Tuesday for four or five days at sea, singlehanded training. 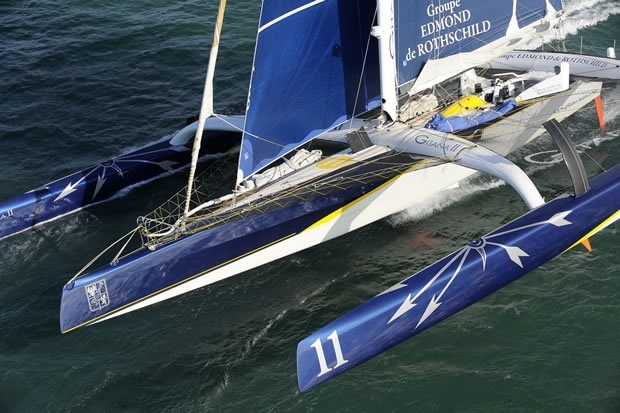 However Guichard has been forced to direct his 77ft tri towards port in southern Ireland when 62 hours after setting off towards the Fastnet Rock, some damage was sustained to the starboard float. Following discussion with the Gitana shore team, Guichard headed for Dingle, the nearest port, where he arrived on Saturday to effect repairs and hopes to resume his training as soon as possible. Unfortunately the arrival of the shore team was of course hampered by the travel disaster resulting from the Icelandic volcanic ash and they only made it to Dingle on Sunday after a long ferry crossing. Initial inspection indicate that the damage to the float may have been caused by a collision an 'unidentified floating object' or simply the conditions and sea state - 35 knots and 3-4m seas.